We offer a range of resources. If you'd like a copy, please get in touch! Our amazing booklets were created by the wonderful Kamila Krol of Pigeon. 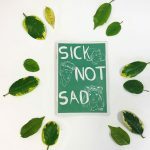 These booklets help explain mental health. We are happy to send you a booklet all we ask is that you pay postage and packaging. If you want more than one we are happy to do some, however, we ask for a donation to cover the costs of the printing. 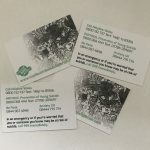 Our help cards are business card size and fit in your wallet. Like our booklets, we are happy to send you some, however, we ask for a donation to cover the costs of the printing. We will always send you a few more than you asked for so you can leave them out and about as they may help someone. We have several t-shirts in different designs, as well as hoodies, mugs and bags. 100% of our profit goes straight back into My Discombobulated Brain and our work. See the whole range on our Facebook Store. 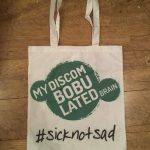 Our #SickNotSad, material, festival wristbands are a firm favourite. These help you share our message and help us raise valuable funds. They are really comfortable woven fabric wristbands with a toggle clip meaning that you can take it on and off. 100% of our profit goes straight back into My Discombobulated Brain and our work. 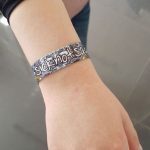 Our wristbands cost £1 plus P&P. Buy now. Our #SickNotSad, material, lanyards are fab. These lanyards help you share our message and help us raise valuable funds whilst helping you keep your keys and or pass to hand. 100% of our profit goes straight back into My Discombobulated Brain and our work. 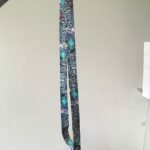 Our lanyards cost £3 plus P&P. 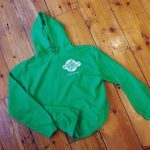 A unisex hoodie shown here in our signature green with the Discombob logo in white on the left hand-side. These are also available in child and adult sizes and can also be done in other colours upon request. These are honestly incredibly soft and cuddly and are printed by the AMAZING Weird Triangle. Buy now. There are two mug designs – one is our logo and background and the other is just our logo. These are produced by the AMAZING Weird Triangle. Buy now. Our tote is a practical shopper. One side has our artwork from the funky one and the other side has our logo and hashtag. These are printed by the AMAZING Weird Triangle. Buy now. I am so lucky to have such amazing friends! Teri from Deep Breaths Collective and I have known each other for sooooo many years and we know each other so well. When I was putting ideas down for some tees, she was the first person in my mind. Teri’s tees are inspirational and beautiful and I am so honored we have one. This is a white unisex tee with a black design and our logo on the bottom right hand-side. These are available in child and adult sizes and are printed by the AMAZING Weird Triangle. Buy now. 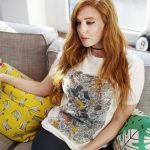 A unisex tee with our background artwork which was donated to us by the most amazing artist in the States. This artwork is in the background of our logo etc and we LOVE it, so it just seemed logical to put it on a tee! These are available in child and adult sizes and printed by the AMAZING Weird Triangle. Buy now. 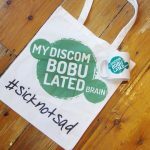 A unisex tee in white with the Discombob logo in our signature green on the left-hand side and our hashtag #SickNotSad across the shoulders on the back. These are available in child and adult sizes and printed by the AMAZING Weird Triangle. Buy now. 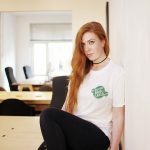 A unisex tee in our signature green with the Discombob logo in white on the left-hand side and our hashtag #SickNotSad across the shoulders on the back. 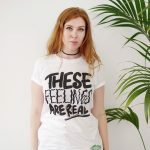 These are available in child and adult sizes and are printed by the AMAZING Weird Triangle. Buy now. We are available to come and do talks in schools, colleges, universities, business’, events and conferences. Basically anywhere where you will let us. 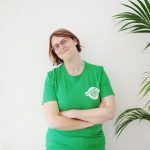 Get in touch to talk about working together.